With 14.4Mbps HSDPA & 5.76Mbps HSUPA, surfing, downloading & uploading is a Zappping experience. Zapper 3G SIL300B supports 2G/3G SIMs and works with Windows, MAC OSX and Linux. You can now forget the internet lag & enjoy a sheer pleasure of the world of online and digitalization. No need to hang on with just one Operator. Work it as per your convenience. Change it as per your usability. Now moving from one city to another would not change your virtual speed. 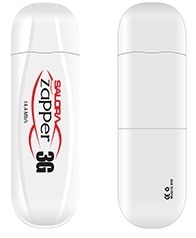 Also, Salora Zapper 3G SIL300B can be used with any 2G/3G GSM SIM card. Now download your favorite songs, movies and games with a blink of an eye & store them in your own Zapper 3G SIL300B. With a storage support upto 32GB, you can keep and access your data anywhere and anytime without any further constraint.